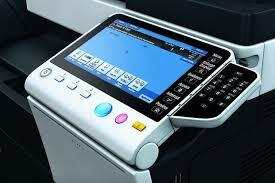 The new Olivetti d-Color MF554 replaces the highly successful MF552Plus. This is not a radically new and unproven engine it is simply a development of the MF552 with additional refinements and a few extra features including a 300 sheet single pass duplex document feeder. The MF554 retains the same outstanding performance and productivity of the MF552Plus. Don't even think of looking at the Ricoh, the Canon or the Xerox they simply can't stand comparison against this excellent device. Ask us to propose this model for you with our managed print support and you will be able to forget reliablity issues and concerns over your print fleet.